Pay items are the components that make up a person’s pay. These parts include tax, take home pay, allowances, superannuation, health benefits, union payments, etc. The Pay Item list screen shows you a list of the default pay items you get when you sign up for Saasu. You can add and remove from this list, but bear in mind that certain situations will require the inbuilt pay items to be used, in order to generate the correct payslips and required tax reports. Generally the core wage components. For example, hourly pay, overtime, bonus or commissions. Generally taxable but seek your own advise for your specific circumstances. These may be deductible or non-deductible for tax calculation purposes depending on your specific circumstances. You can find specific examples in the Payroll Deductions help note. Annual Holiday Leave, Personal Sick Leave and other employee entitlements as per your legal and/or contracted requirements. Saasu allows you to set up custom pay items for things such as custom overtime rate, uniform allowances, car, and travel allowances. You will need to establish with your advisor if the pay item taxable and what tax code if any apply. You will also need to decide whether to include this pay item when calculating certain entitlements or employer contributions. In some cases, you may want to exclude certain wage and salary components when calculating particular entitlements and employer contributions. To set up custom pay items, select Cog icon > Settings > Payroll > Manage Pay Items. Once you have set these up, you can use them in the default pay and in your payroll transactions. Lump sum payments relate to specific types of payments like employees termination payments above thresholds. It is recommended that payments made to employees, that need to be reported via Single Touch Payroll (STP) or mapped on Payment Summaries to a Lump Sum (A, B, D, E), use the inbuilt Lump Sum pay items. That way when mapping pay items to Payment Summary fields or reporting via STP these amounts can be mapped correctly to the Lump Sum and not Gross Payments. You have just set up a uniform allowance wage and salary Pay Item and you want to exclude this from Employer Contribution > SGC Super calculation, which is calculated as 9.5% of gross pay. You have just set up a custom overtime rate (eg Overtime 1.25x) and any overtime that falls in this category must be excluded from leave entitlements and SGC Super. Open each of the pay items you want to apply exclusions to. (In the example above, Employer Contribution > SGC Super, Entitlement > Annual Holiday Leave, Entitlement > Personal Sick Leave). Click Exclusions when the pay item is open. Tick the pay items that you want to exclude. (In the example above, they would be Uniform Allowance and Overtime 1.25x). 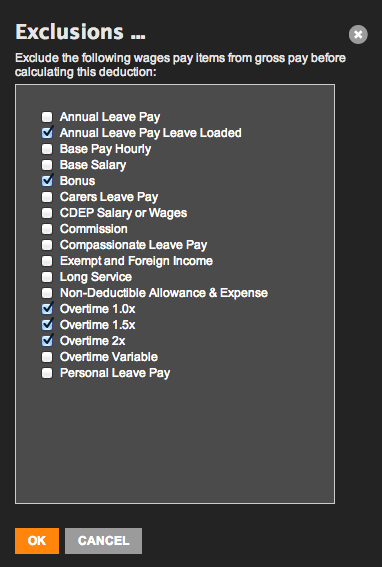 Click Payroll in the main menu. 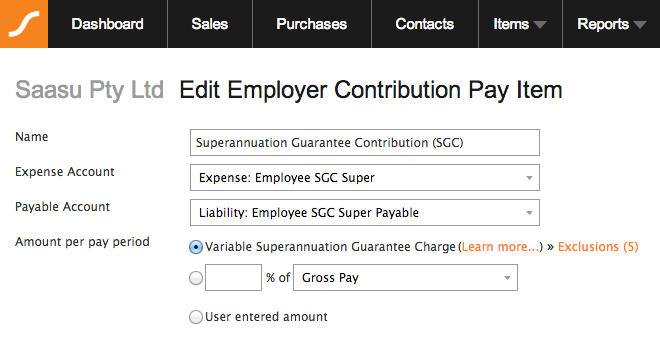 Click the edit (pencil) icon to access the Employer Contribution pay item. Click the Exclusions link to access the list of pay items that are available for exclusion in the pay item’s calculation (those ticked are excluded). Pay Items of the type Employee Entitlements may have an option to choose Variable calculation methods. This is to support government and/or regulator set percentages that apply for particular periods of time in the tax year. Most commonly this applies to Superannuation and Pensions. Behind the scenes Saasu has inbuilt capability to calculate basis specific time periods. These are specific to the zone or country your file is for.